Reuse, reheat, re-eat: How to revive your leftovers like boss! Just look inside any cramped mini fridge on campus. I bet you’ll find at least a dozen crumpled to-go boxes filled with leftovers bound for the trash. Believe it or not, most doggie bag contents—with a few exceptions—can be up-cycled with a little magic from your dorm room microwave, toaster oven, and hot sauce collection. Yes, I suggest you take copious notes. You will be quizzed at the end of the story. And quit texting, you in the back of the class. SAVE THEM! 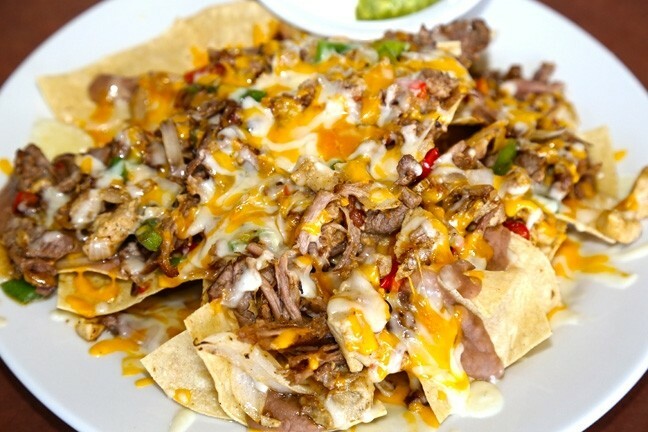 : It’s hard to finish a big plate of nachos, but save some for later. A toaster oven will re-crisp up the chips and re-melt that cheese. Just remember to get the guac on the side; nobody likes hot, brown avocado. Chapter One: The Basics. This is a bit of elementary science for you, pure and simple. Leftovers that tend to have more moisture in them: a slice of pizza with veggies on top, a wet chicken burrito, or salsa-splattered nachos—should always go in the toaster oven for a blast of dry heat. Always! If you don’t have a toaster oven, get one. Wilted pizza crust will perk up with delightful crunch, sandwich bread will regain its pertness, and even a neglected hunk of fried chicken can become browned and edible again. That being said, gooey and sauce-based meals (half eaten mac and cheese, lasagna, soups, mashed potatoes and gravy) can benefit from a quick nuke in the old microwave. You already knew that, though. Now let’s get to Chapter Two: Gaming the System. How do we ensure that we get one, two—even three—extra meals out of a single brunch or dinner date? Think ahead when you order. That burger patty may still be delicious, but no one wants to eat a soggy day-old bun loaded with too many condiments. To avoid this kind of wastefulness, always have your food cut in half. That means you can spread ketchup or ranch dressing over half your burger and keep the other half dry and pristine for another meal. For this reason, dressings should always be ordered on the side, ensuring that you don’t waste an especially bountiful salad loaded with nutritious veggies (dry salad will keep in your mini fridge for at least a few days and can be incorporated into wraps—everyone’s favorite portable snack because you can eat them while swiping left on your iPhone. 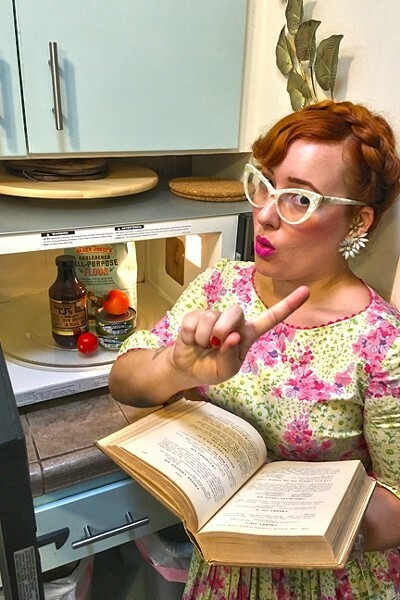 TO REHEAT OR NOT TO REHEAT: Flavor writer Hayley Thomas knows how to dine and doggie bag. Never toss a half-eaten burger or slice of pizza when you’ve got a microwave and/or a toaster oven. Another tip? Learn how to ask, “Are you gonna eat that?” It may sound tacky, but it could earn you a few extra calories in donated leftovers. Just make sure you know the person you’re asking. That could get really weird. R.I.P: Foods that can never be reused (this is sad but true, so eat all of these items immediately or you will be regretting it for the next four years): french fries, anything with avocado on it (it just turns brown and unappetizing), a fried egg with a broken yolk, Hollandaise sauce, syrup-soaked pancakes, shredded taco lettuce, fresh baked kettle chips, sushi, cooked spinach. Surprisingly enough, bacon is not on this list, but be sure to throw it in the toaster oven, not the microwave, lest you want to eat a flabby piece of fat. Chapter Three: Tasty Transformations. Here’s a few masterpieces you can make in less time than it takes to hit “deny” on your RA’s Facebook friend request. All you need to do is stock up on cheap items like sliced bread, tortillas, eggs, shredded cheese, and a few veggies. • Leftover Frank’s Chili Dog into Sloppy Joe: Throw that soggy bun right in the waste basket. Cut up the hot dog and scoop the whole mess, beans and all, onto two fresh slices of bread. Pop in toaster oven. Top with Red Hot. Bam. • Leftover Tacos de Santa Cruz into Burrito Bowl: (When given the chance at Mexican restaurants, ask for whole beans instead of refried and get any guac or sour cream on the side.) Discard any spent tortilla and scoop innards into a bowl. Heat in microwave. Top with chopped veggies, salsa, Tapatío. Extra credit: Add leftover salad lettuce for a fresh crunch. Canned sweet corn is also a nice addition! 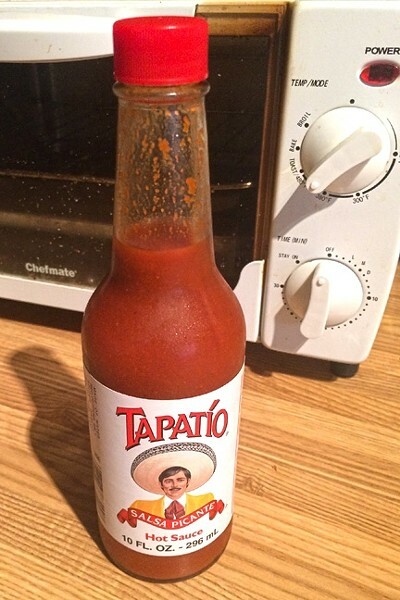 PEP : Hot sauce is your new best friend, if it wasn’t already. It can spice up, dress up, and renew leftovers from the comfort of your dorm bed. • MoTav Nachos into Chilaquiles: Discard any super soggy chips. Lay remaining bean-and-cheese covered nachos on toaster oven tray and allow to crisp up, turning golden brown. Once very hot, crack an egg on top and continue to cook in toaster oven for a few minutes, until it reaches desired doneness. Top with red salsa and, if you have it, half an avocado purchased from Thursday night Farmers’ Market. Fancy, right? • Leftover Louisa’s Place Breakfast Platter into 10 Second Breakfast Burrito: Place any leftover bacon and home fries in the toaster oven. Nuke leftover scrambled eggs quickly in the microwave with a paper towel on top; go easy so they don't explode. Wrap everything in a fresh tortilla, shove a few ketchup packets in your pocket, and run to class. You’re late again, but at least you won’t arrive hungry. Chapter Four: Bulk up! Still unsure how to feed yourself on the cheap? There’s one other tip I’d recommend, but you’ll probably just tell me to speak to the hand. What? The kids aren’t saying that anymore? Whatever. Here it is: Learn to cook in bulk! A bag of beans, a bag of grains, and a few other staples will go a long way if you’ve got the time and patience to spend each Sunday cooking meals for the rest of the week. I know, it sounds like advice your mom might give you, but she’s usually right. Just like learning to do your taxes or talk to cute guys, there’s no easy, quick fix, but hopefully the knowledge I have presented to you will get your stomach through the next semester. I’ll see you in four years, when you’re finally ready to wield a frying pan and your metabolism has simply said, “no more” to jalapeño poppers. Enjoy ’em while you can! Hayley Thomas wishes she could still eat jalapeño poppers. She can be reached at hthomas@newtimesslo.com.